Tim Challies wrote a piece titled “Boys Need Their Moms“. I am thankful for the relationship Tabitha has with Wyatt. She balances out my rougher parenting edges with a tenderness I find hard to provide. Odd that Challies references James Dobson’s Bringing Up Boys. Dobson’s chapter aimed at moms is brief and lacking any substance. Tabitha and I were terribly disappointed in it. I am thankful for the small group of friends that I have; I am also thankful for slowly learning that it is okay to tell another guy that you love them. Tim Challies has a great article up today entitled “The Myself I Was Yesterday“. Thought I’d share. Tim Challies has been running a great series entitled “Visual Theology”. 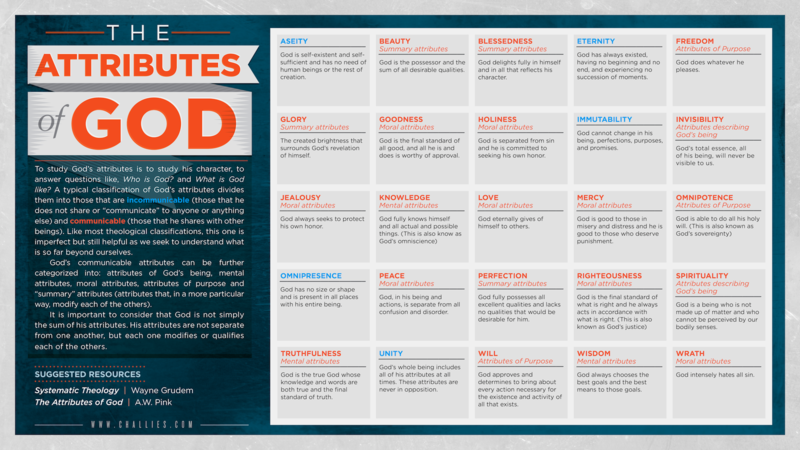 His second infographic in the series, The Attributes of God, is a fantastic reminder of who God is. I’m hoping to use this in teaching Bible study on Wednesday nights. Thanks Tim!